The marvel of the moving picture is now at your fingertips. Remember the first time you drew those sequential stick figures on the outer margins of your 8th-grade copy of ‘To Kill a Mockingbird’? The GIF computer file is sort of the modern version, and a new camera gives you physical copies. Designer Jiho Jang captured this novel concept with his camera, the GIF-TY. 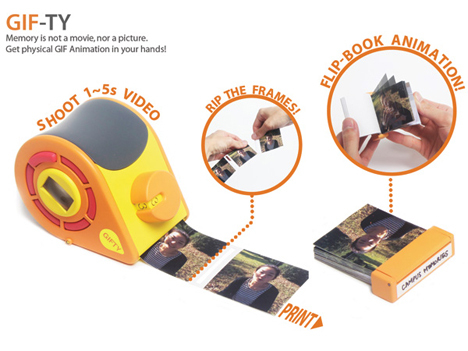 It uses the burst-shot technology of a Polaroid camera and a ‘Zero-Ink’ printer to give you sequential photographs. They print out in a strip that allows you to rip each frame apart and stack in order to make a mini-film. 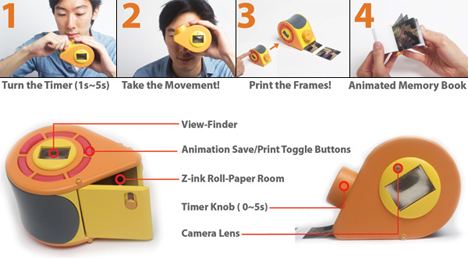 The GIF-TY has a timer that can make the flip books between 1-5 seconds. The two principle ideas behind a ‘movie’ – persistence of vision and phi phenomenon – are very captivating. Jang seemed to have this in mind when he created GIF-TY. The camera fully realizes this, along with that unique memory GIF-TY helped you create. See more in Camera & Video or under Gadgets. December, 2013.